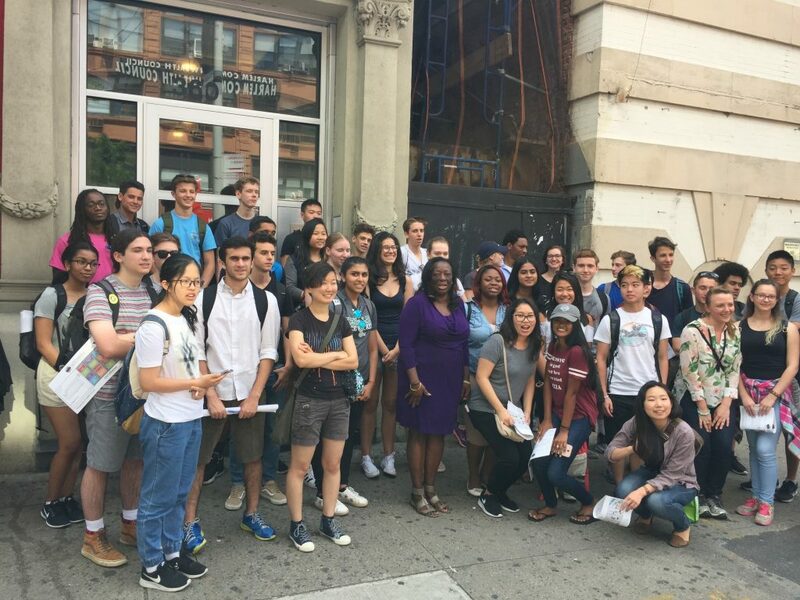 The 2017 Summer High School Program engaged students in a study of 125th Street, an integral broad crosstown street in Manhattan’s historic Harlem neighborhood that has seen extensive demographic and economic change in recent years. As part of the course, titled ‘Sustainable Urbanization: New Designs for the Future City,’ students worked with the 125th Street Business Improvement District (BID), an organization that works with members of the Harlem community to improve the experience of those who work, live, visit, and invest in the neighborhood. The students worked in groups to develop design concepts that consider the needs of the 125th Street BID, as well as the interests and desires of the general public, all while engaging in the ongoing, global dialogue surrounding sustainability and urbanism. Each group of students selected and researched a section of 125th Street. The groups used a host of software including GIS, Adobe Illustrator, Photoshop, and SketchUp Pro to make the designs and prepare graphics for presentation. Topics the groups addressed included: waste management; the integration of culture and green infrastructure; adding green space; creating more communal areas; traffic congestion; street vendor disorganization; educational engagement; and remembering Harlem’s musical contributions. On the last day of the course, the students presented their innovative designs to their Columbia University instructors, including the Urban Design Lab’s Director and Co-Director, Richard Plunz and Patricia Culligan; representatives from the 125th Street BID including Barbara Askins, President and CEO; and other Columbia researchers and professionals. Throughout the course, students learned about major themes in urban design, such as pedestrian-friendly streets, sustainable infrastructural systems, design that considers climate change, and the search for design interventions that address public engagement with social and environmental issues. The students now have tools to consider urban issues that will be relevant for decades to come.